Each year the Washington State BMW Riders club designates a "Club Ride" to follow through the summer riding season. 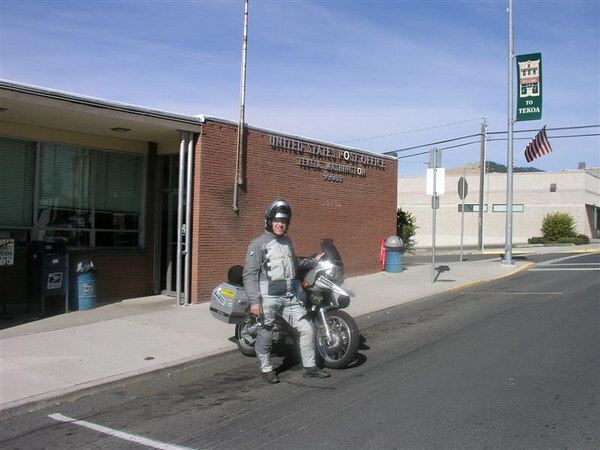 This year the theme was small town post offices, A to Z. I missed Lind and Olga and the bonus ride to Hyder Alaska and the club rally site picture. BUT I had a great time scouting out these small townsa and linking them together with my GPS into a tour of the state on four different trips to the four corners of Washington. I usually met a local person picking up mail whom I recruited to hold the camera. Sometimes I just held out the camera pointed at the PO with me in the frame. Lots of fun. I couldn't imagine anyone wanting to print one of these so they are resized at relativly low resolution.